This past March, around the same time I began to blog for The New York Jewish Week, a banner ad on the Jewish paper's website caught my attention. The ad featured a head-shot of a man and the text "My Rabbi Saved My Life." First, I thought "what a great ad since it grabs your attention and makes you want to click through to see what it's all about." Clicking on the link took me to a website for The New York State Diabetes Campaign. There, I learned that this was part of a Faith Fights Diabetes campaign aimed at religious leaders and encouraging them to speak with their congregations about diabetes and general health. On the Faith Fights Diabetes campaign website, there are seven religious leaders including a guru, rabbi, priest, minister, pastor, and two imams (one male and one female). My father was diagnosed with Type 1 Diabetes when I was two-years-old, so this is certainly a cause that I am directly connected to and one that has my full support. But I also wondered whether it is the role of clergy to get involved in the medical lives of those in our congregations. This subject truly resonated with me recently when the spouse of one of my congregants asked me to intervene in his wife's eating habits. He felt that she, a diabetic, was eating poorly and putting herself at a great health risk. 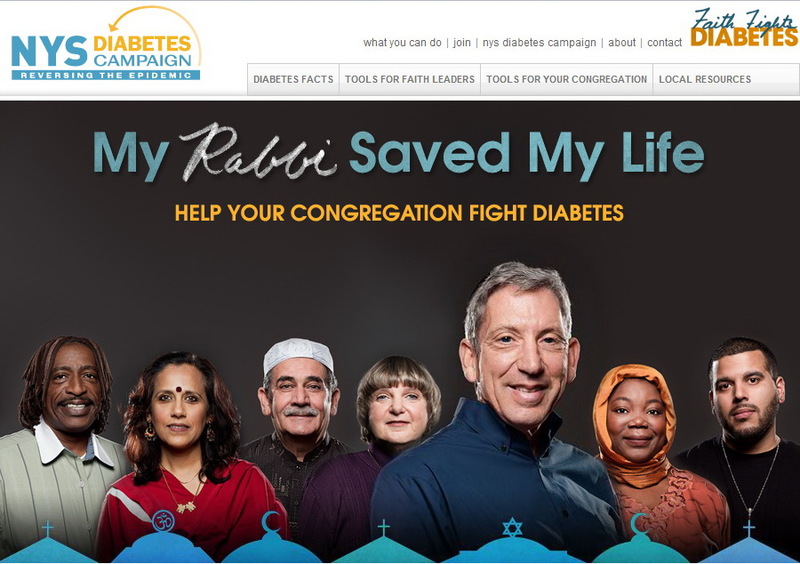 I thought of the Faith Fights Diabetes campaign and how rabbis (and other faith leaders) really could play a positive role in the health lives of our congregants. When I served an internship at a large synagogue in New Jersey, we had two congregational nurses on staff who served important roles for synagogue members. There, the rabbi might refer a congregant to one of the nurses, but I really don't see a reason why the rabbi himself cannot speak openly about the importance of eating right, exercising and getting regular medical exams. The campaign encourages clergy to learn how to fight the diabetes epidemic in congregations. It recommends that a poster about diabetes is hung in public areas of the church, temple, mosque, or faith-based organization. Some practical tips for clergy include serving healthier food at congregational events and discussing diabetes in a sermon (sample sermons are on the website). As spiritual leaders, we have great influence on our congregants. Why shouldn't we use our pulpit to promote healthy living and ensure that the people we care about are informed about Diabetes? I'd answer that because merely being a rabbi doesn't give you any particular skills to be health education. As you note, what a rabbi has is a puplit. While it might not be part of a drash, letting ones synagogue be a place for health information is clearly a good thing. The diabetes campaign is rightly filling the first gap by pushing posters and other useful information into the hands of clergy so that they can be health educators. For a rabbi to take and use good quality information is a given in my mind. I'll expand the question and ask should rabbis spend time more proactively gaining this knowledge. For example, have you ever received training to observe signs of domestic or child abuse? That would take 2h of your time. How about learning to recognize signs of mental illness, like depression, so you can direct people in need to specialists?